Fathom It! 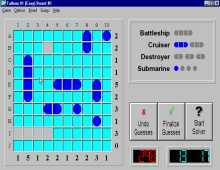 is a fun and addictive puzzler that is an excellent computer version of "Battleships," a popular column that appears in GAMES magazine, among others. The game is best described as a more logical (and fun) variant of battleship. From the developer's game description: "Unlike the classic pencil-and-paper game, Fathom It! boards are solitaire puzzles solved using logical deduction. The object in Fathom It! is to solve the board by locating the underlying fleet of ships using logic alone. A Fathom It! board is a grid representing a section of ocean in which an entire fleet of ships is hiding. The fleet consists of battleships, cruisers, destroyers and submarines. The digits along the right side and below the grid indicate the number of grid squares in the corresponding rows and columns that are occupied by vessels. Knowing the row/column tallies is what makes Fathom It! a logical deduction game. Pit your mind against the board, deduce the location of the hidden ships, and solve the board." Sounds simple, right? Like all classic puzzle games, Fathom It! is very easy to learn, but hard to master. There are starting hints on the board, i.e. exposed tiles, but the clues are still quite difficult especially on later boards. In-game help comes in the form of a built-in rule-based expert system that will provide a fully explained hint anytime, anywhere. You can learn how to solve Fathom It! boards by pressing "Start Solver" and reading the well-qualified explanations. The shareware ("evaluation") version comes with 40 boards that should still occupy you for hours. The registered version comes with over 30,000 boards and 3 different difficulty levels. In short, Fathom It! is one of the most addictive puzzlers I've ever come across, and well worth the $19.95 price tag for the registered version. Two thumbs up!